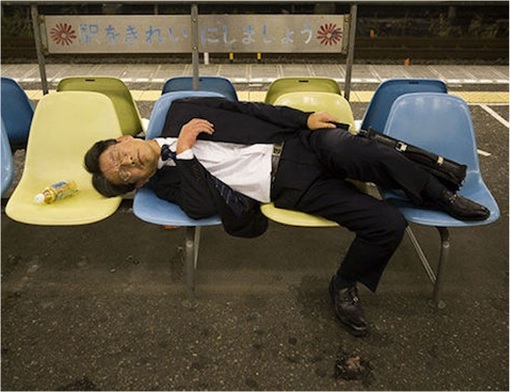 Japan workers are known to be the most hardworking on planet Earth, thanks to its long hours culture. They don’t go back home on time after office hour simply because they would be ridiculed by neighbours for being “lazy”. It’s a huge embarrassment for being labelled as such, hence they work very long hours. 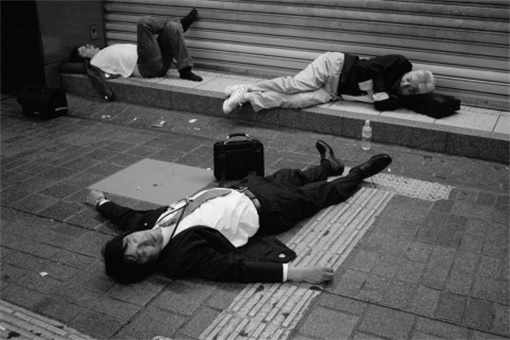 Japanese has a specific word for “death from overwork” – karōshi (過労死). But critics said that could only mean two things about Japanese long hour culture – either they’re loyal or they’re inefficient. 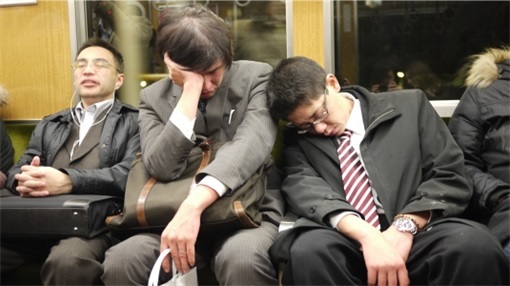 Unlike Europe and America, Japan’s “lifetime employment” system has created a strong company loyalty culture, which in turns translate to extra evening hours, although not necessary high productivity. Yes, Japanese may seems to be super hardworking but foreigners who have worked with them pointed out that in reality, their productivity per hour were low. 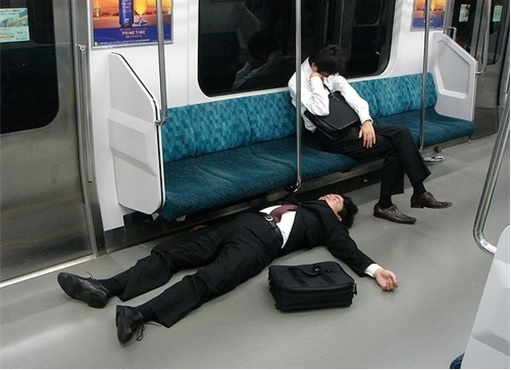 Employees in Japan don’t really have any sense of urgency. It wasn’t important to finish their tasks within a set time limit, as long as they work long hours. They even deliberately drag their feet if the needs arise in order to project a “long hour” working image. 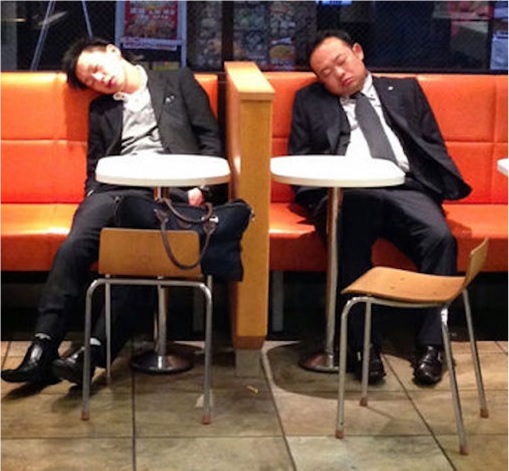 Naturally they get tired and stressful easily, hence Friday and Saturday are the days when “hard-working” Japanese men (and women) “let their hair down” by taking part in post-work “drinking until you drop” get-together session. Here’s the problem – they have low alcohol tolerance. 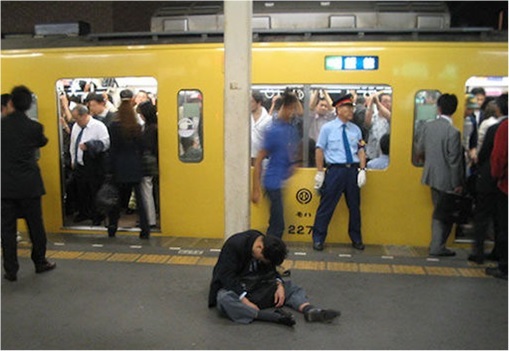 Therefore, it’s a common sight during weekend nights to see thousands of Japanese people sleeping on the streets and inside trains after having too much to drink. 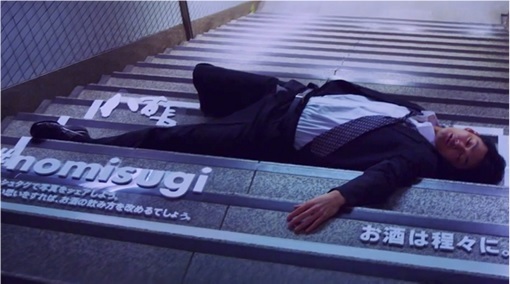 This may be considered normal behaviour in Japan but it’s another matter altogether to see businessmen and workers “sleeping it off” in bizarre positions on steps, garden, pavements, public transport and what not. 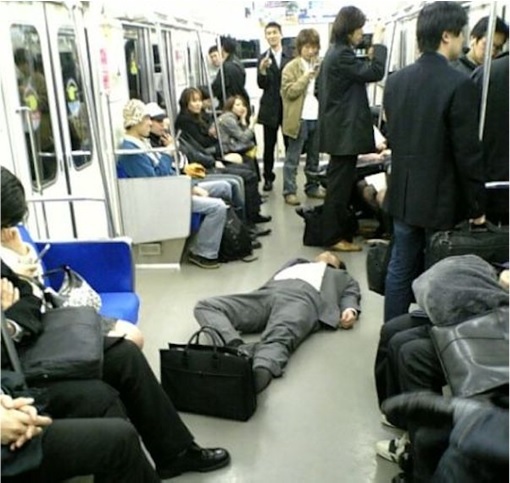 Amusingly, some of these drunken Japanese went the extra miles – they thought they were safely back at home and stripped down to his boxer shorts, with some even sleep naked. 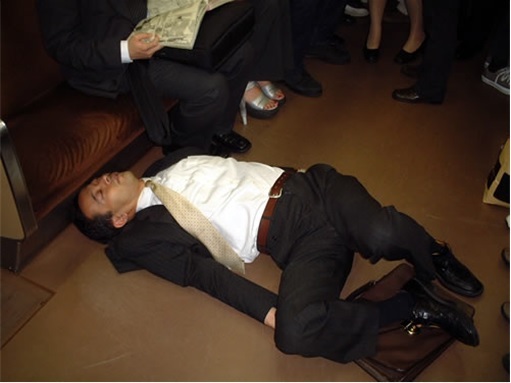 It was so serious that Japan’s government has recently estimated 6.45 million people in the country suffer from alcohol-related problems – many because of its culture of after work drinks meetings. 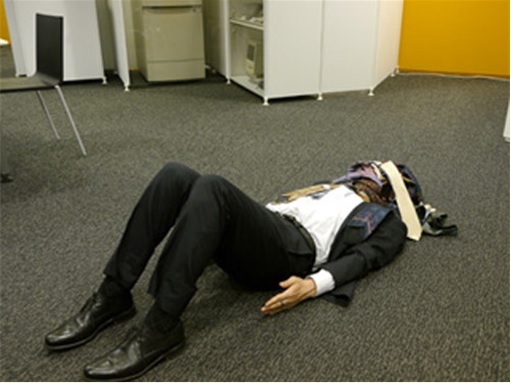 If that was not bad enough, Japanese culture where one has to entertain his boss to drinking session or else the prospect of job promotions would be in jeopardy, worsen the scenario. 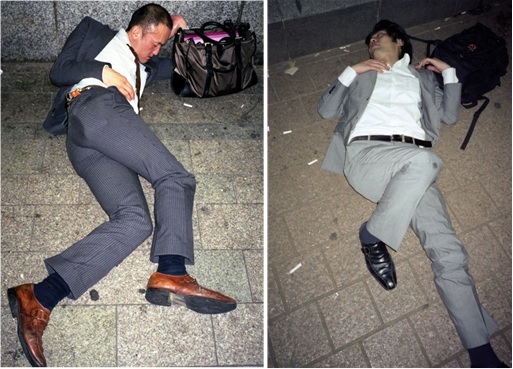 Here are some photos of embarrassing photos of Japanese workers and businessmen passed out in public, thanks to their drinking culture due to working long hours. 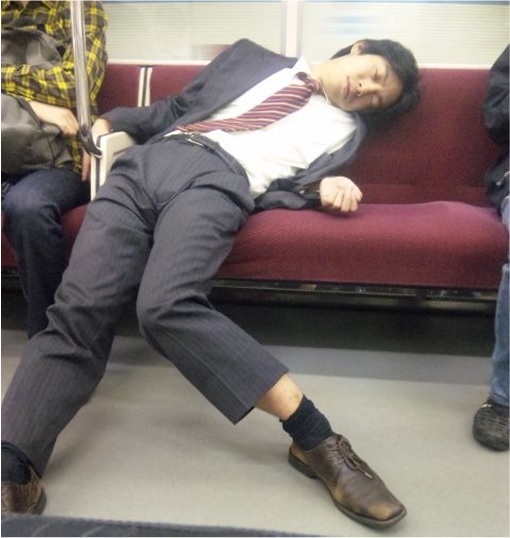 This guy seems to have a style of his own when sleeps on the train. 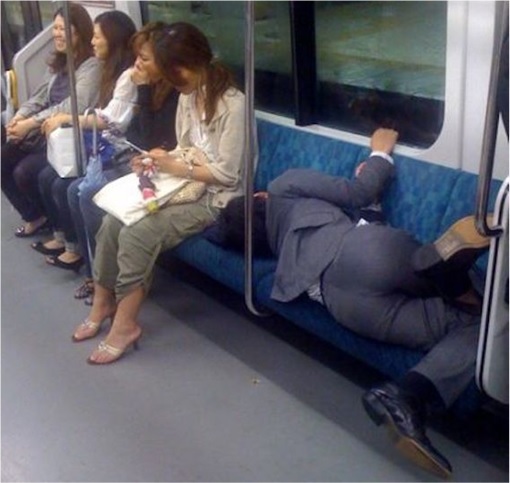 We bet he can stands while sleeps if he couldn’t find a seat. 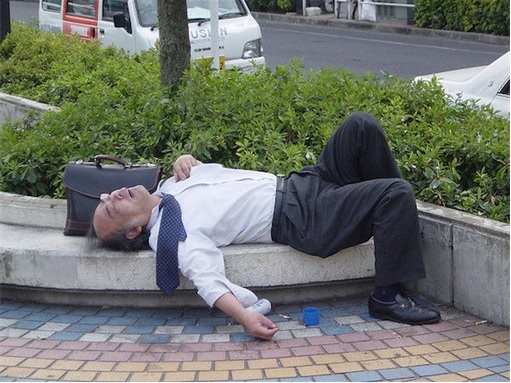 We admire greatly this sleeping drunk. Obviously he has a great balancing act between sleeping and not appears to sleep. 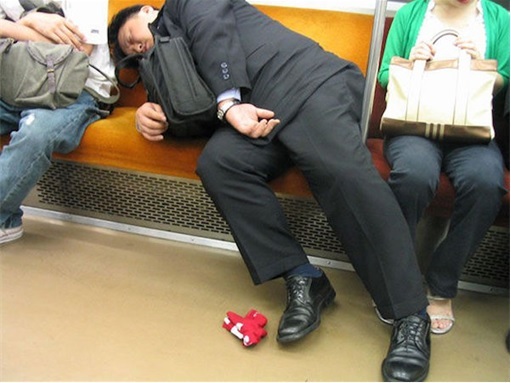 This Japanese chap wins the trophy hands down. He may think he was safe at home hence the all clothes off except for his boxer. What a beauty!! 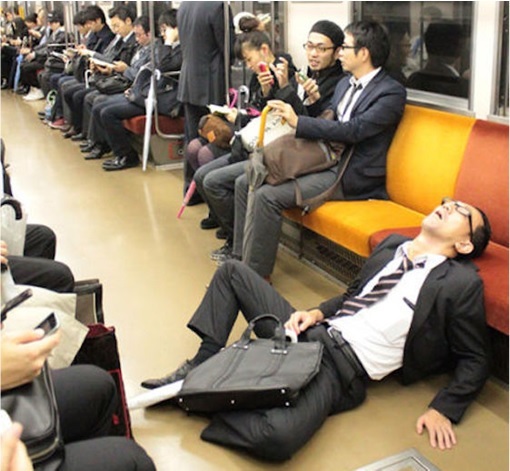 From the way other commuters didn’t help but some decide to continue reading his comic instead, it shows such sleeping drunks inside trains are a common sight. Anyway, we hope nobody accidentally steps on him … or his precious part. 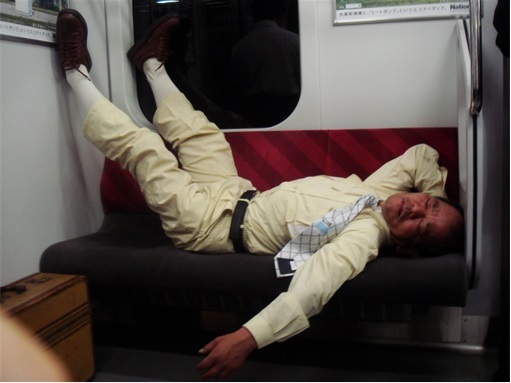 Another photo that shows trains in Japan are designed for multi-purpose – for transportation as well as temporary beds during “emergency”. 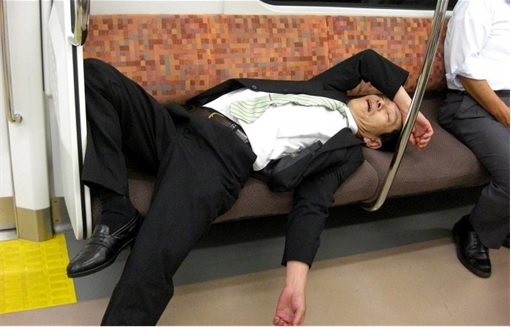 Intoxicated, this businessman is using more seats that he paid for. Time to get the train conductor to check his ticket? If you think the guy above was bad, this one is worse. Perhaps it’s time for a new policy to force people who are drunk to buy min 3-seats before boarding. Then only it’s fair, no? 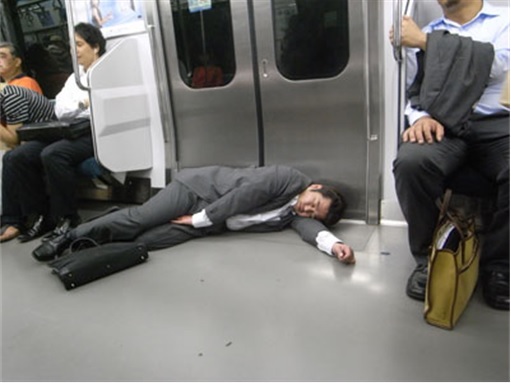 This businessman was so intoxicated that he couldn’t even find his way to the sub. Luckily he found a comfortable area to sleep. 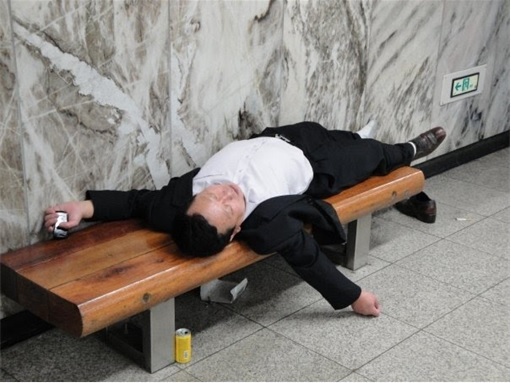 Japanese Government should build more such “sleeping facilities” to accommodate sleeping drunks. Didn’t they say there’re about 6.45 million of such people in the country? Let’s hope this uncle do not get free early breakfast – from birds on top of the trees. 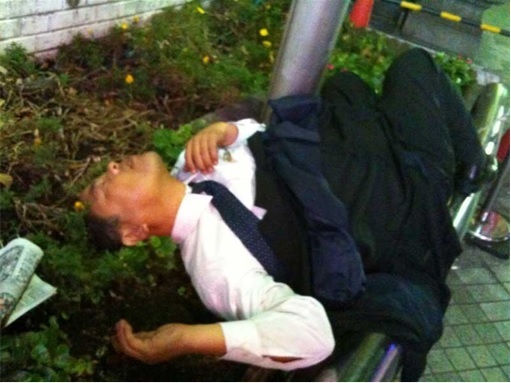 This “hard-working” Japanese seemed to be drunk from office’s party. Wait a minute – he’s not “dead”, is he? 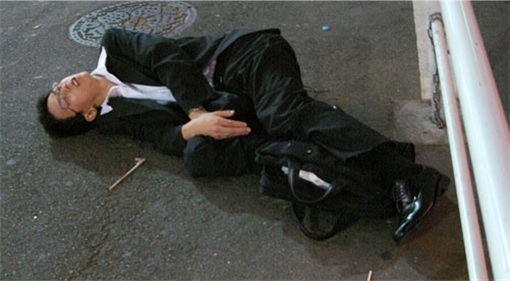 Another classic pose from a sleeping drunk. 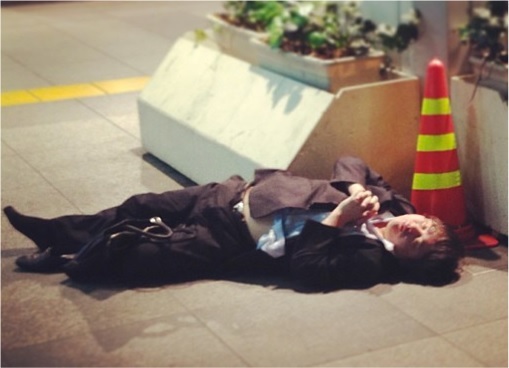 But on a second thought, we’re not sure if he was drunk or merely … praying. Two of a kind – from their body language, these two colleagues or friends seemed to have found their freedom – from working long hours. 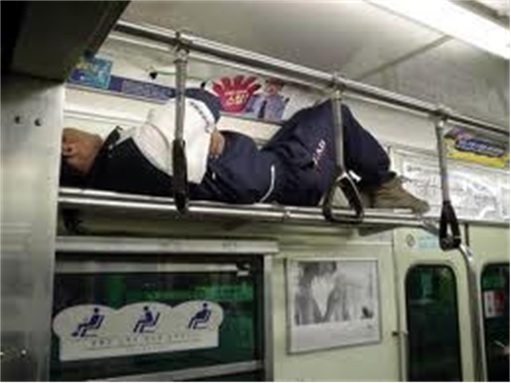 Sleeping drunks could be the Japanese culture, but we hope the authorities would make it an offence to sleep in dangerous spot such as below. We hope this young & smart employee doesn’t end up under the railway once the door opens. Our guess is the first guy on the left works as an analyst while the second works as an operation executive. As much as the world doesn’t know what Luis Suárez was thinking when he bites the Italian player during Uruguay-Italy World Cup match, we are equally puzzle how this guy managed to climb up there for his nap. 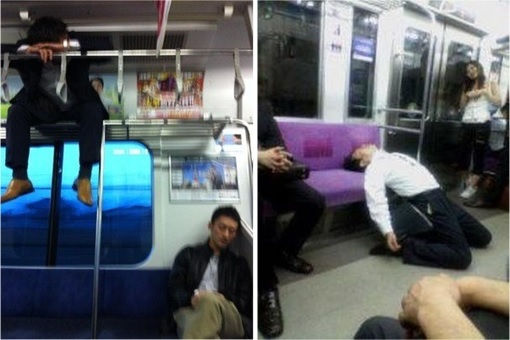 Seriously, Japan should send this guy to the next Olympic Games for the gymnastics event. Surely he could win a medal, or two. 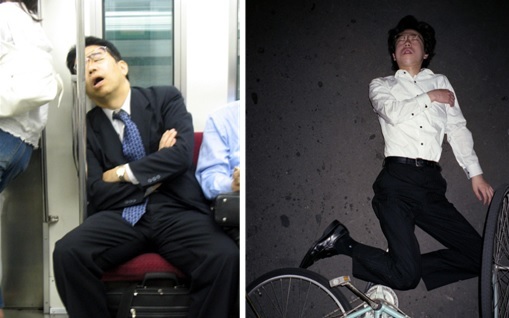 This is perhaps the most talented Japanese sleeping drunks out of 6.45 million people. But was that sleeping drunk or rather “sitting drunk”? Obviously, this is the best mannered person when he wasn’t drunk. He will definitely offers his seat to the elderly or disabled. Know how we knew it? The problem of beer session in Japanese culture knows no boundary – young Japanese employees are no exception, whether they like it or not. An unfortunate (or rather lucky?) 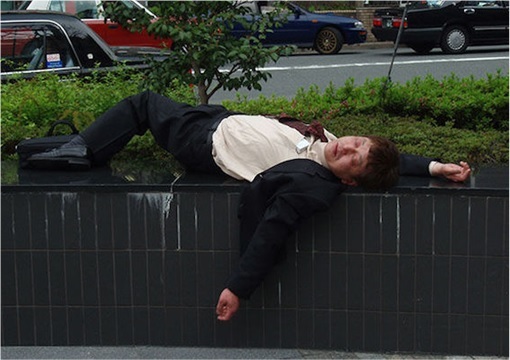 guy who made it to the “nomisugi” billboard – or popularly known as “Sleeping Drunk Billboard”, where photos are taken and uploaded to the social media with the hashtag #nomisugi (too drunk). It would be a waste if this guy ends up in a tragedy, when the next drunk trailer driver roll over him. We hope he stays where he is, and not roll under the seat, as that would mean another missing person case needs to be reported. It’s always good to have good friends or close buddies who share laughter and pains together, not to mention beautiful paradise-liked pavements. Again, we have no freaking idea how a drunkard could cleverly climb and make himself a first-class seat as the guy on the left. 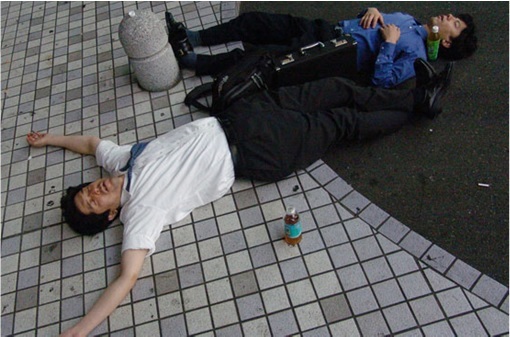 Equally amazing is the second guy who could sleep drunk while performing Samba dance. Where To Get The Cheapest Beers? What’s The Best Selling Beer Brands?